HomeUnited States of AmericaFloridaKissimmeeSPECIAL OFFER - New Townhouse in Orlando FL - Close to Disney and Outlets! SPECIAL OFFER - New Townhouse in Orlando FL - Close to Disney and Outlets! SPECIAL OFFER - New Townhouse in Orlando FL - Close to Disney and Outlets! in Kissimmee is a holiday home with. Set in Kissimmee, within 4.3 km of Kissimmee Value Outlet Shops, SPECIAL OFFER - New Townhouse in Orlando FL - Close to Disney and Outlets! offers accommodation with free WiFi and air conditioning. This holiday home is 7 km from 192 Flea Market and 8 km from Plaza del Sol Kissimmee. The holiday home has a flat-screen TV, a well-equipped kitchen with a dishwasher and 4 bathrooms with a bath or shower. Speaking English, Spanish and Portuguese at the 24-hour front desk, staff are always on hand to ...help. New Townhouse in Orlando FL offers an outdoor pool. The property features a playground. Fun 'N' Wheels Fun Park is 8 km from the accommodation. The nearest airport is Orlando International Airport, 30 km from the property. Set in Kissimmee, within 4.3 km of Kissimmee Value Outlet Shops, SPECIAL OFFER - New Townhouse in Orlando FL - Close to Disney and Outlets! offers acc...ommodation with free WiFi and air conditioning. This holiday home is 7 km from 192 Flea Market and 8 km from Plaza del Sol Kissimmee. The holiday home has a flat-screen TV, a well-equipped kitchen with a dishwasher and 4 bathrooms with a bath or shower. Speaking English, Spanish and Portuguese at the 24-hour front desk, staff are always on hand to help. New Townhouse in Orlando FL offers an outdoor pool. The property features a playground. Fun 'N' Wheels Fun Park is 8 km from the accommodation. The nearest airport is Orlando International Airport, 30 km from the property. When would you like to stay at SPECIAL OFFER - New Townhouse in Orlando FL - Close to Disney and Outlets!? Facilities of SPECIAL OFFER - New Townhouse in Orlando FL - Close to Disney and Outlets! 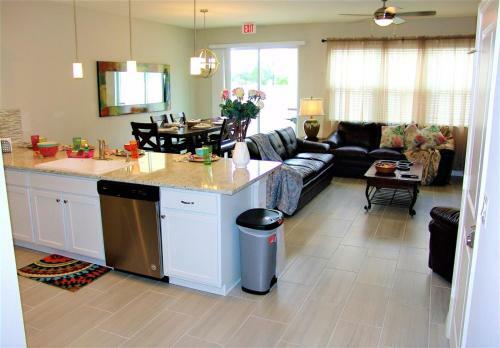 Policies of SPECIAL OFFER - New Townhouse in Orlando FL - Close to Disney and Outlets! Children and extra beds Up to two children under 12 years stay free of charge when using existing beds. There is no capacity for extra beds in the room. Supplements are not calculated automatically in the total costs and will have to be paid for separately when checking out. Guests are required to show a photo identification and credit card upon check-in. Please note that all Special Requests are subject to availability and additional charges may apply. This property will not accommodate hen, stag or similar parties. Please inform SPECIAL OFFER - New Townhouse in Orlando FL - Close to Disney and Outlets! in advance of your expected arrival time. You can use the Special Requests box when booking, or contact the property directly with the contact details provided in your confirmation. Address SPECIAL OFFER - New Townhouse in Orlando FL - Close to Disney and Outlets! United States of AmericaFloridaKissimmeeSPECIAL OFFER - New Townhouse in Orlando FL - Close to Disney and Outlets!